No hassles. No headaches. Absolutely FREE Web Hosting migration with zero downtime. Looking to move your website from your current web host but unsure how to do it? We offer professional Website Migration service FREE of charge to ease the process of moving your hosting services. Our professional migration team has processed thousands of successful web host migrations without any downtime. We take the stress away as our migration team handles the entire process seamlessly. 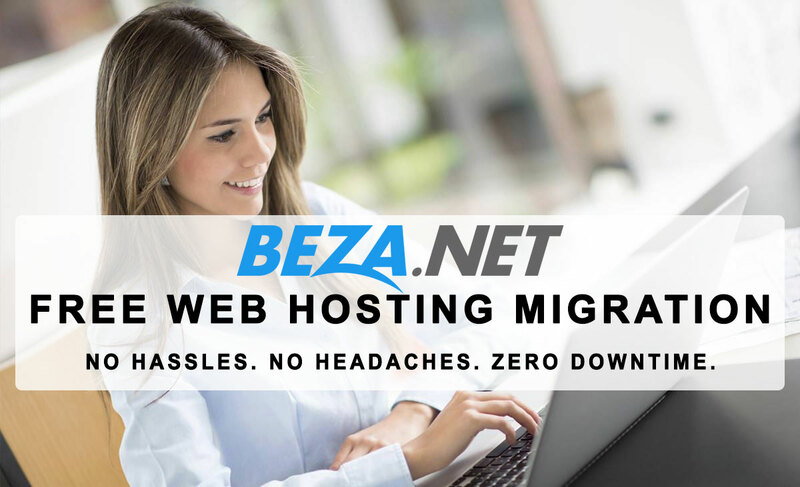 Our team will handle all the migration details so you can start taking advantage of your new BEZA hosting account fast! Our team of skilled migration technicians will plan and migrate your websites efficiently from your old hosting company to our high performance secure web hosting infrastructure. Sit back and relax. It’s that simple. What’s Included with the Account Migration? We work with you to schedule a date and time ideal for your business to start the move from old Web Host. The Website Migration is typically scheduled during off-peak hours to minimize any impact to your business. You’ll receive a migration plan based on the in-depth analysis of what services will be migrated, when migration will start and when we estimate it will be completed. Migrating all website(s) and web assets (i.e. images, audio, videos, etc.) starts and we’ll perform an audit to confirm all files successfully migrated. We’ll reconfigure your email exactly the same way it’s setup on your old Web Host. Then we’ll start migrating all E-mail accounts, mail forwards, mail aliases, etc. Our migration team will move all databases (currently we support MS SQL and MySQL full migration). We’ll also generate new unique DB usernames & passwords so your protected and update all web files linking to those databases with the new database credentials. We’ll update your domain nameservers (or DNS zone) to point your website(s) to your new BEZA hosting servers. Depending on your domain registrar and/or DNS provider, it might take up to 48 hours for DNS to fully propagate across the Internet. The migration team will perform an in-depth analysis of your existing services with the old Web Host. This analysis is used to build a migration plan for a successful switching of Web Hosts without any downtime. You’ll get our exclusive 100% ZERO-Downtime guarantee. All your services are guaranteed to continue to operate fully during the migration process (as long as your old Web Host doesn’t experience an outage). A full security scan of all website(s) assets and any web applications (eg Drupal, WordPress, etc) is performed to confirm they are free of any malware and viruses. Syncing of all of your e-mail accounts so you don’t loose a single e-mail. We’ll even re-sync e-mail post DNS propagation in case e-mail got delivered to old Web Host. Extensive 170 step Post-Migration QA Testing to confirm all migrated websites are fully operational on your new BEZA account prior to switching DNS. If anything doesn’t pass our QA testing, rest assured our engineers and web developers will promptly resolve it. Allow 1-2 days post DNS update before cancelling service with your old Web Host provider. This ensures proper DNS propagation. That’s it! Another successful web host migration is complete and a new happy customer. No hassles. No headaches. We’re Here When You Need Us 24×7. Whether it’s helping you choose a domain name, migrating your website, or configuring your email system for your business, our professional experts are here to help. Switching to a new web host can be a complicated process. We offer professional Website Migration service FREE of charge to ease the process of moving your hosting services over to us.